This morning we received a inquiry from 'Paige B' who asked, "What is the expiration of RPC sensafe Ozone strips after opening? Thanks." Good morning, Paige, and thank you for your inquiry. All of the water test strip products we carry bear expiration dates not from date of opening, but rather expiration dates based on manufacturing dates. With that said, the SenSafe™ Ozone Check product (MPN 481234) packaged in bottles of 50 tests a 24 month shelf-life from date of manufacture. As with any testing product, how one stores the product before opening and after opening matters a great deal. Water test strips exposed to excessive temperatures (high or low), sunlight, moisture, and/or chemical vapors in the air (i.e. storing chlorine test strips near containers of dry or liquid chlorine) will have a negative effect on the accuracy, range and shelf-life of the products. SenSafe™ Ozone Check detects ozone levels in water as low as 0.05 ppm and as high as 0.5 ppm in approximately 30 seconds without the need for expensive meters, messy chemical reagents, or complicated test procedures. Current inventory (as of 12/30/14) has expiration date of August 2016. The SenSafe™ Ozone Check water testing product provides accurate ozone level in water test results in only 30 seconds and offers sush a low detection limt (0.05ppm) because of its patented aperture technology. 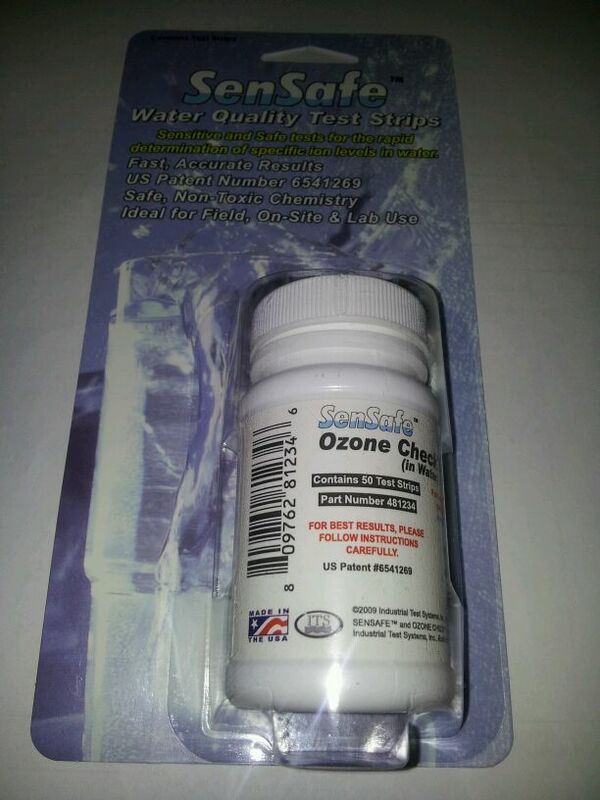 Dip one SenSafe™ Ozone Check test strip into a water sample measuring at least 50mL (roughly 1 3/4 ounces) with constant, gentle back-and-forth motion for 10 seconds. At the end of ten seconds remove the strip from the sample, shake one time to remove excess water from the testing window, wait 20 seconds, and match the color in the aperture window to the nearest color on the color chart on the bottle. Where Can I Get a Well Driller Master Test Kit? Today’s inquiry came to us from ‘Ramprakash’ who very plainly said, “I want to buy Master Water Testing Kits”. We think you have excellent taste water test kits, Ramprakash, because the Well Driller Master Test Kit puts the power to perform multiple samplings on water sources right where it belongs: In the hands of private well owners. Where to buy the Well Driller Master Test Kit? At this time we know that FilterWater.Com carries both the Well Driller Standard Test Kit and the Well Driller Test Kit. 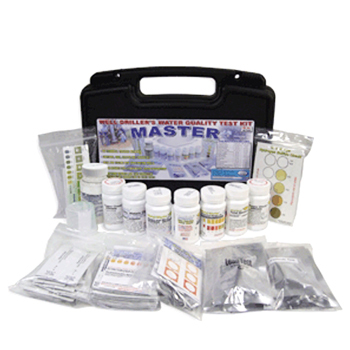 The Standard kit has a few less tests and costs around $160 while the Master kit has a cost of around $240. Regardless of which option you choose, we suggest picking up extra Coliform Bacteria Tests since both kits come with only one test for bacteria. You can acquire extra Coliform Bacteria Tests in our Water Test Kit Store for around $7 per test.